I had someone request another drawing the other day. They gave a bit of a description of it and I did my best within those parameters. 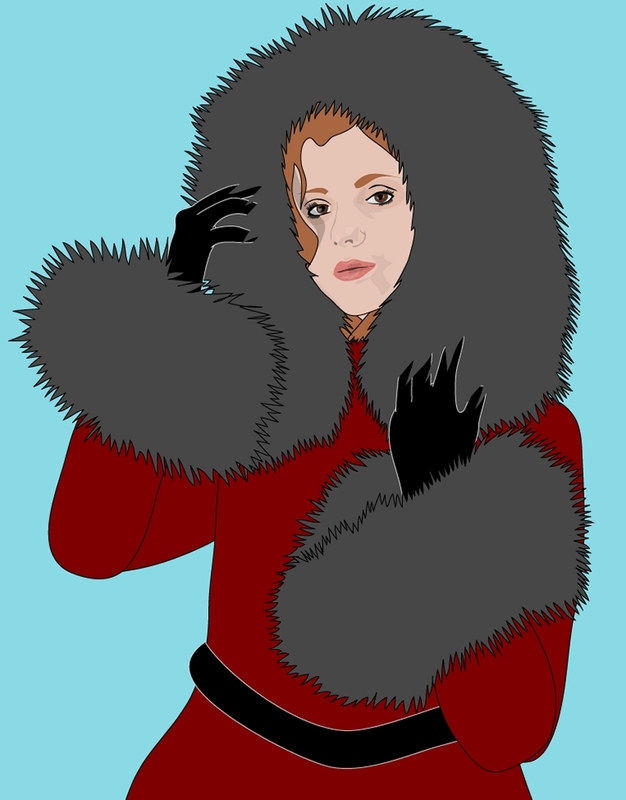 This one didn't quite turn out like I wanted it to... but I also sort of just kind of pushed to finish it without going in and adding the shading on the coat. I suppose I may revisit it at some point and finish it up. The 2011 fall/winter collections are starting to roll out on department store websites. The good news for fur lovers, there's lots of it. The bad news is, it's a really mixed bag in terms of styles. It seems there's a split between shaggy and sleek, and much of the shaggy might be warm, but isn't all that flattering to the figure. Another plus is that designers seem to be getting away from skinny leg pants. I've always found those to be sort of gross, the way they tend to give women chicken legs and I'm sure there's many out there that have pushed themselves towards eating disorders to pull it off. I though the pinned pant look in the 80's was sort of off and I feel the same way about skinny leg pants. Here's a few things that have caught my eye so far this year.